Credit: ESO/M. Kornmesser. This figure is licensed under CC BY 4.0 International License. 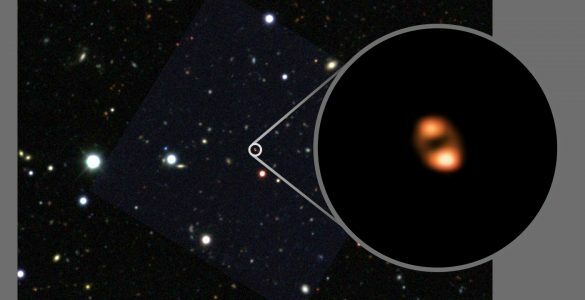 “This is different from what we see in the nearby Universe, where galaxies in clusters grow by cannibalizing other galaxies. 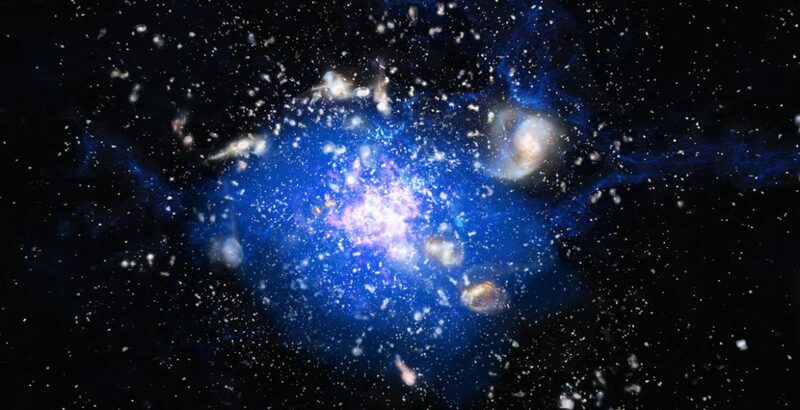 In this cluster, a giant galaxy is growing by feeding on the soup of cold gas in which it is submerged,” said Bjorn Emonts of the Center for Astrobiology in Spain, who led an international research team. The scientists studied an object called the Spiderweb Galaxy, which actually is not yet a single galaxy, but a clustering of protogalaxies more than 10 billion light-years from Earth. At that distance, the object is seen as it was when the Universe was only 3 billion years old. The astronomers used the Australia Telescope Compact Array (ATCA) and the National Science Foundation’s Karl G. Jansky Very Large Array (VLA) to detect carbon monoxide (CO) gas. The presence of the CO gas indicates a larger quantity of molecular hydrogen, which is much more difficult to detect. 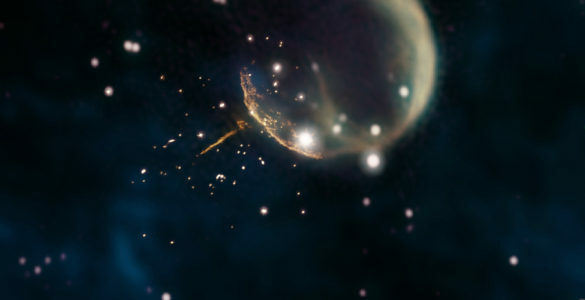 The astronomers estimated that the molecular gas totals more than 100 billion times the mass of the Sun. Not only is this quantity of gas surprising, they said, but the gas also must be unexpectedly cold, about minus-200 degrees Celsius. 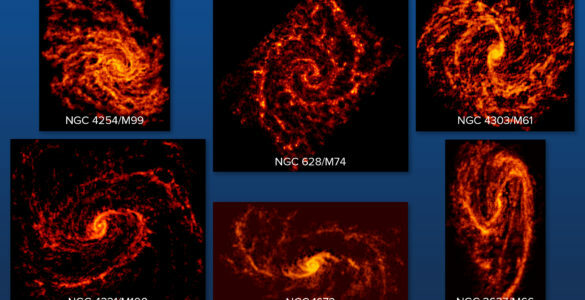 Such cold molecular gas is the raw material for new stars. The CO in this gas indicates that it has been enriched by the supernova explosions of earlier generations of stars. The carbon and oxygen in the CO was formed in the cores of stars that later exploded. The ATCA observations revealed the total extent of the gas, and the VLA observations, much more narrowly focused, provided another surprise. Most of the cold gas was found, not within the protogalaxies, but instead between them. 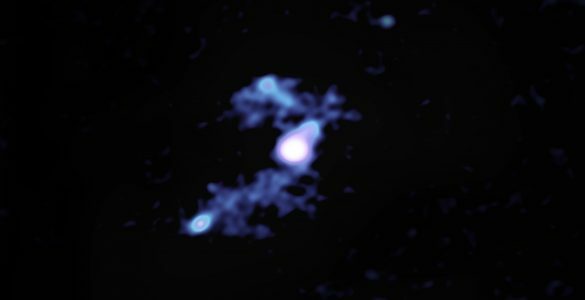 “This is a huge system, with this molecular gas spanning three times the size of our own Milky Way Galaxy,” said Preshanth Jagannathan, of the National Radio Astronomy Observatory (NRAO) in Socorro, NM. Earlier observations of the Spiderweb, made at ultraviolet wavelengths, have indicated that rapid star formation is ongoing across most of the region occupied by the gas. 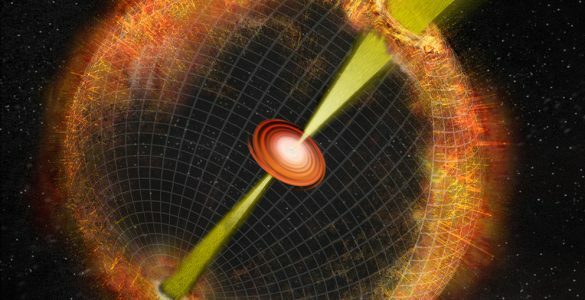 “It appears that this whole system eventually will collapse into a single, gigantic galaxy,” Jagannathan said. 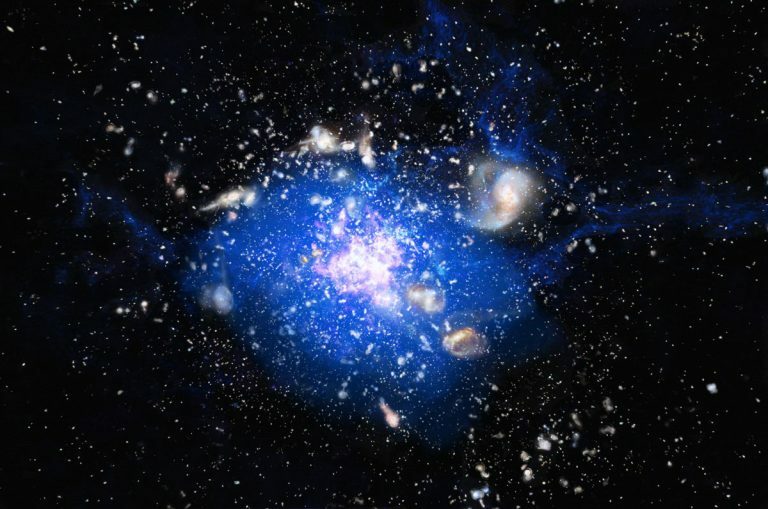 “These observations give us a fascinating look at what we believe is an early stage in the growth of massive galaxies in clusters, a stage far different from galaxy growth in the current Universe,” said Chris Carilli, of NRAO. 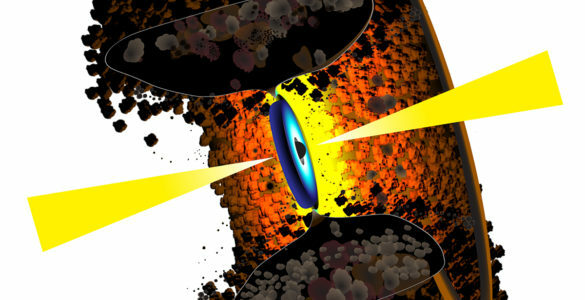 The astronomers reported their findings in the December 2 issue of the journal Science. Artist's conception of the Spiderweb. In this image, the protogalaxies are shown in white and pink, and the blue indicates the location of the carbon monoxide gas in which the protogalaxies are immersed.